Arabic is a pattern of applying mehndi on hands. 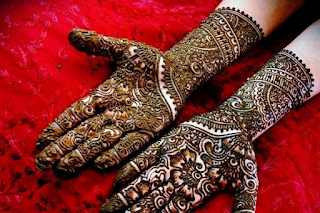 Mehndi is a must in most of the marriages of the Asian countries. Henna is usually applied with the help of a cone. 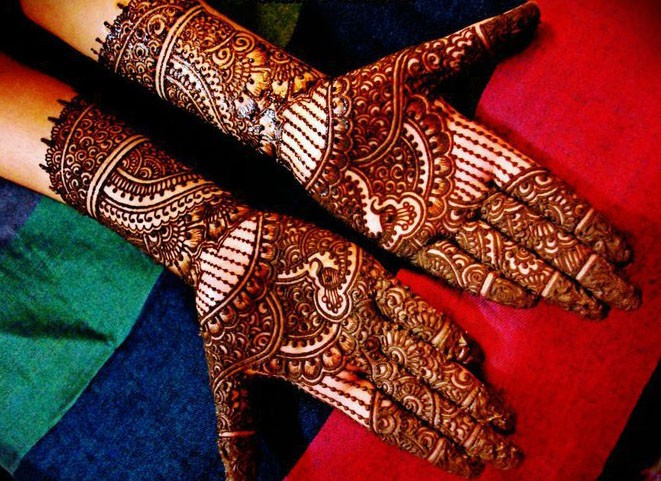 Mehndi leaves are pasted and sealed in a secured manner inside a cone. 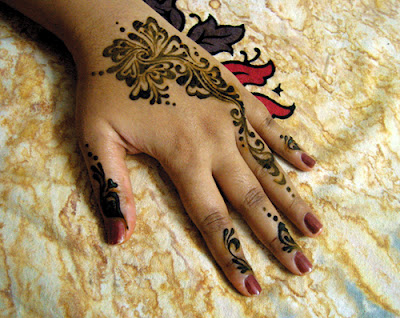 With the help of the cone the designs are made on a palm. 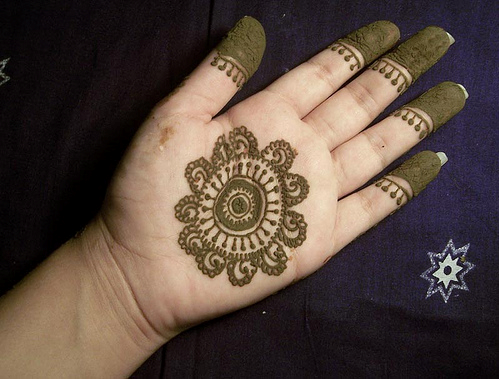 Applying henna is very healthy and hygienic. 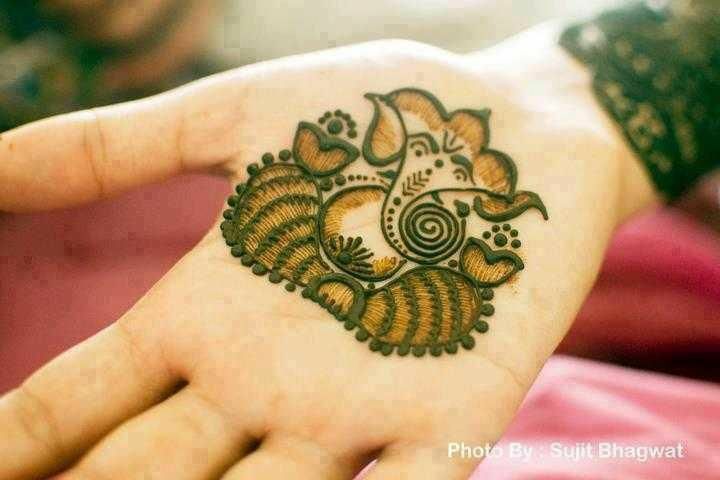 Applying this is considered as an art. 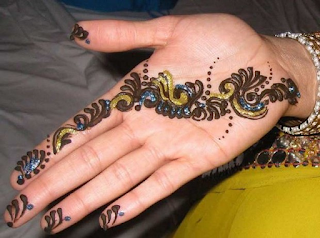 Apply henna so that it looks like you are wearing a jewelry on your hand- Henna can applied in such a way so that it looks as if you are wearing a jewelry on tour hand. If you have to make a design on someone’s hands who is getting married recently then this is the perfect design that a beginner can make. 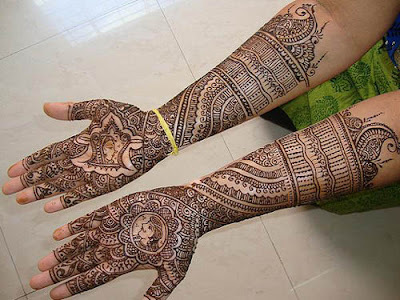 If you want to avoid the pain and suffering that a person undergoes while making tattoos on their body in the western style then for them hennas designs sounds right. 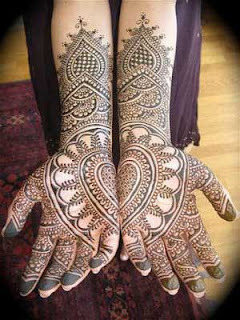 This design is made in such a way that it gives you a wonderful visual effect. You can now make a very simple flower on your palm if you are in hurry. 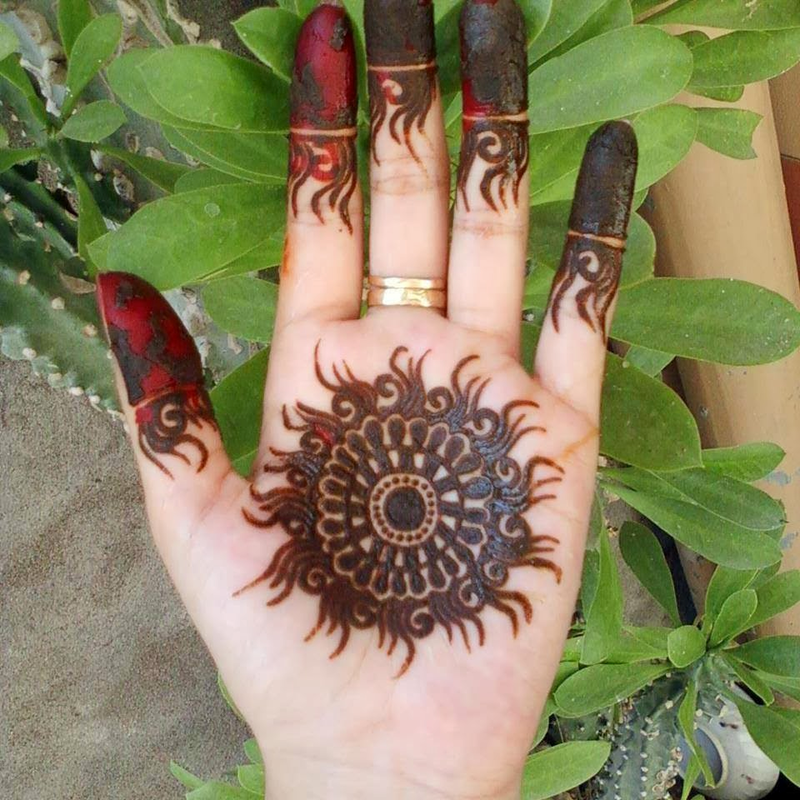 To be made when you go ethnic- If you want to wear something ethnic as you are attending some cultural festival then you can make some traditional designs on your palm. 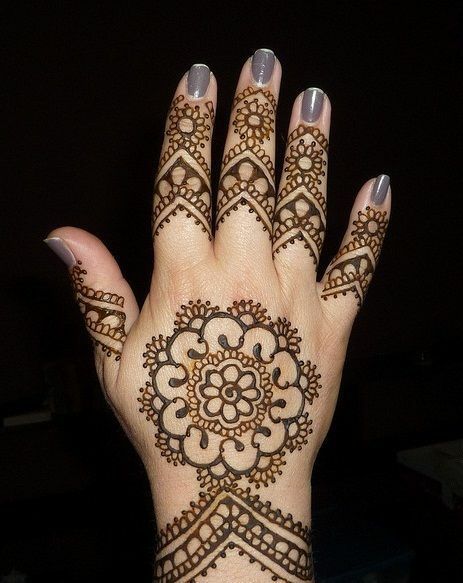 Fill in the gaps with different colored sparkles- When you draw the henna design then you have to leave several spaces in your design so that you can fill in those areas with sparkles to make it look interesting. 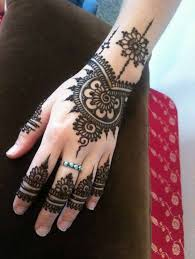 Design the back of your wrists- If you want to make a small design at the back of your wrists only then that can be done also by this kind of mehndi designs. 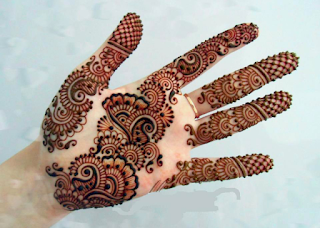 Gorgeously design your fingers - You can only make henna designs on your fingers. If you are not in a mood to make elaborate designs then just the fingers will serve the purpose. If you want a small and cute henna design in Arabic style. Then this design will do the trick. 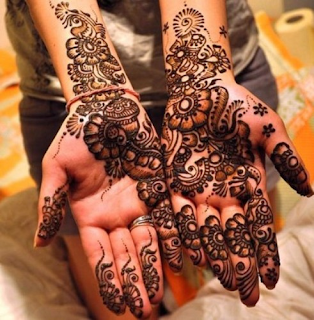 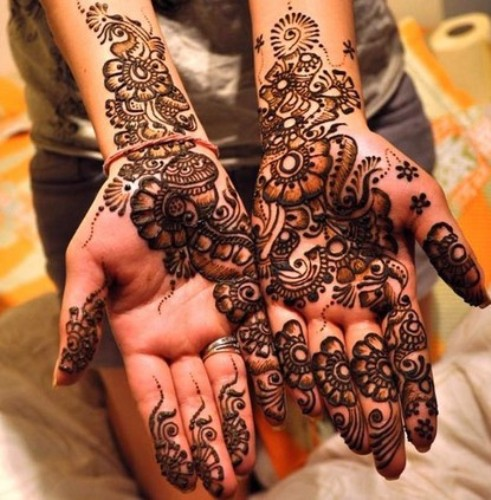 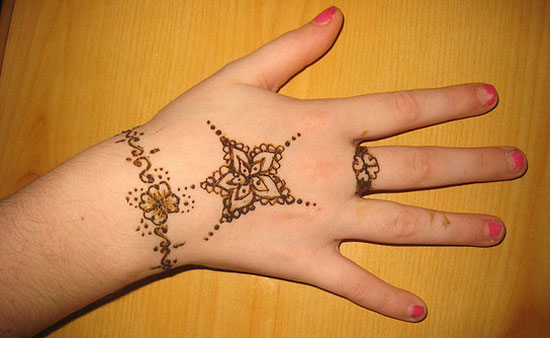 Festival special designs- If you have a festival coming then you will apply henna. 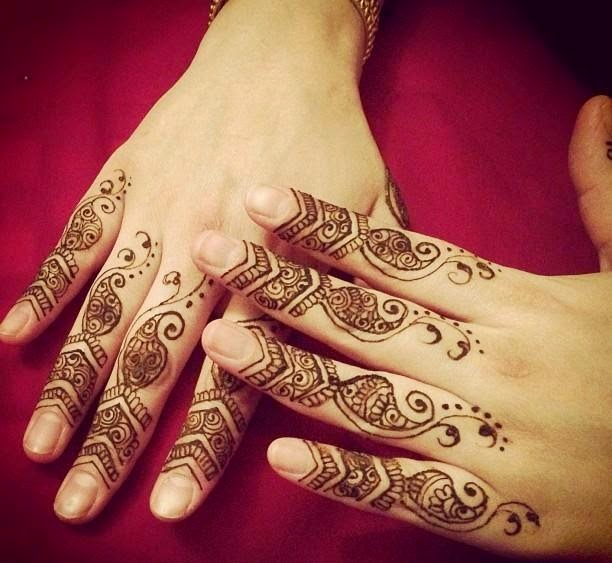 Are you in search of a small and easy design for your hands? 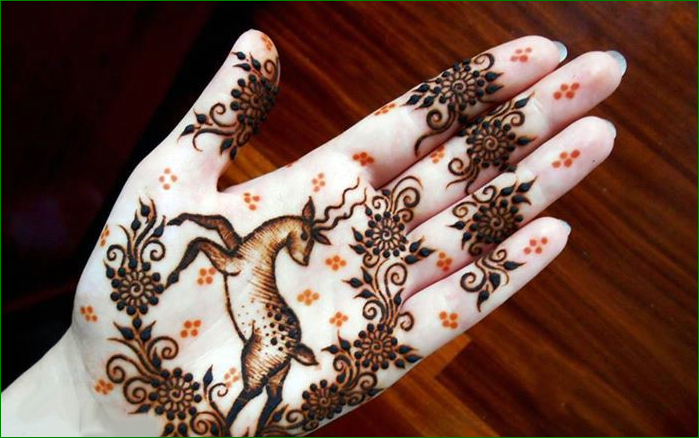 Then here it is. Business world henna design- If you have to attend a party and you want to color your hands with henna. 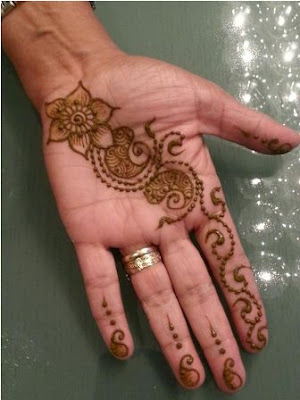 Then there are some simple and quality designs available for you. 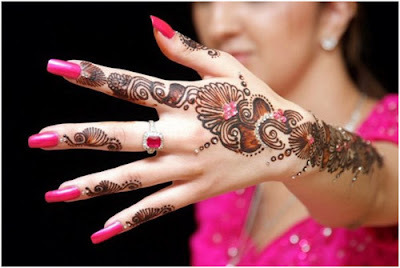 Hennas design for durga pujas - If you have your pujas nearby then you can color your hands with henna with some easy designs. 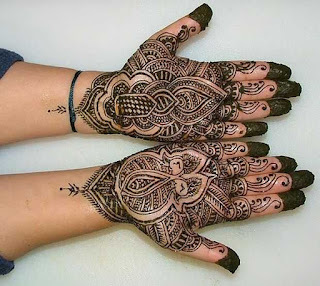 Hennas design for Diwali- during Diwali woman color their hands with henna. 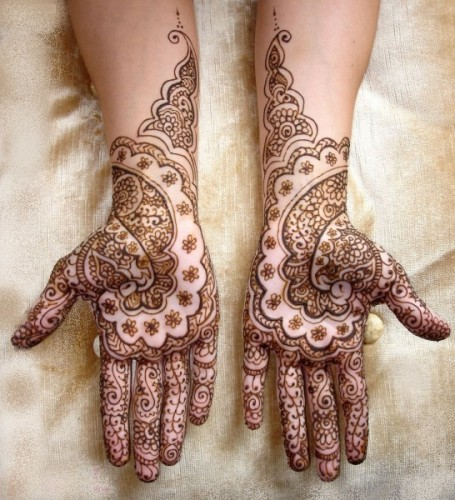 If you want to dress up properly with the perfect henna design on your hands then you can do the below shown design. This festival is usually celebrated for the long age of the husband. Woman usually dresses up a lot on this day and henna is a must on their hands. 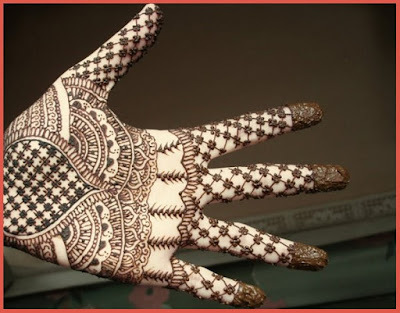 On this occasion the people of Maharashtra dresses up according to their culture. 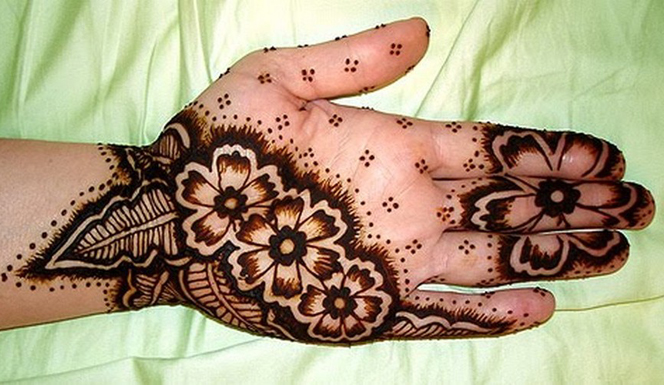 Woman do not let their hands go without henna. 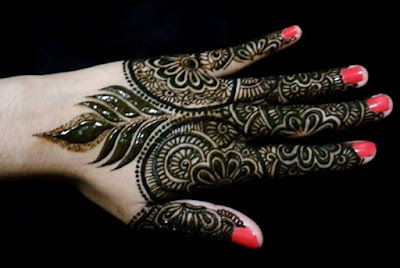 Decorating your mehndi with alta - When you are making any kind of an Arabic design on your hand then you can also decorate it will atla. 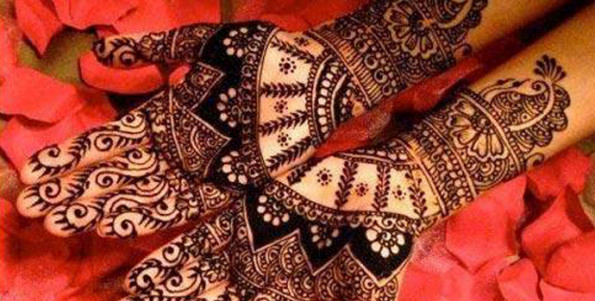 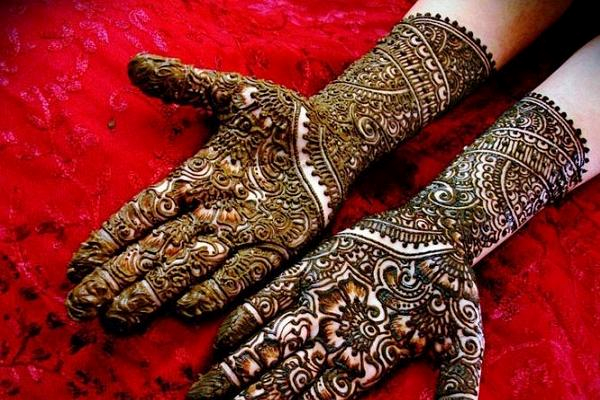 Mehndi Designs on Teej - On this festival the woman of Rajasthan decorate their hands with henna designs and fast for their husbands. 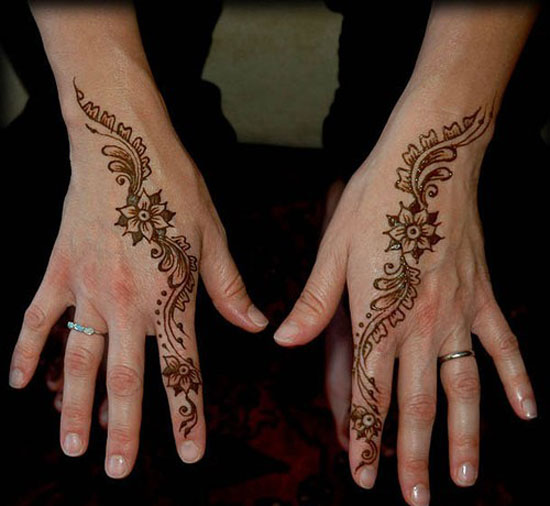 Henna design on the back of your hands - You can make easy and simple designs on the back of your palm. 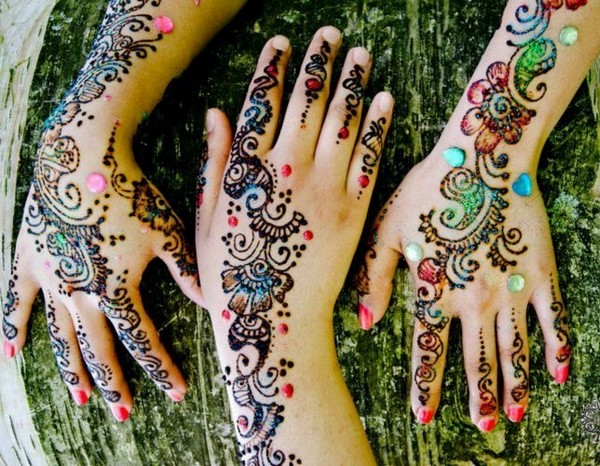 Use different skin friendly colors on your henna design- By doing this your henna will brighten more and more. 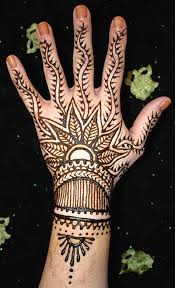 Draw images on your hand which is symbolic of something like nature. 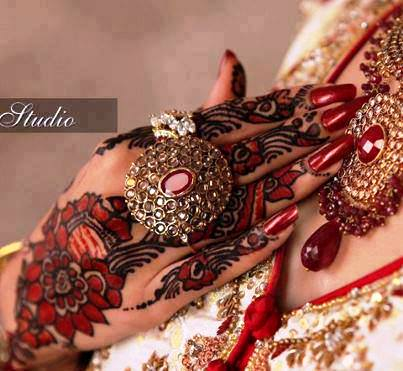 Decorate your henna design with special beads and stones. If you want to stay in style and make a henna design on your hands even when you wear a pair of jeans and top then you can make this design. 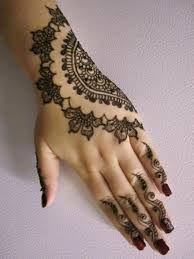 Continuation of henna designs till your elbow in a conjoined manner. 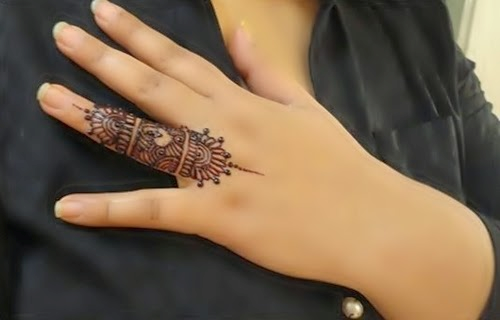 Do some thick mehndi designs on your hand. Make some sleek designs on your palm like the below mehndi design.